Poll: What do you think of the poison tipped arrows idea? I was also thinking no matter the duration or the potency of the bottle of poison used to craft, it would always turn out to be the same strength of the weakest poison potion and last only 10 - 15 seconds. Tell me what you guys think? I also like the concept, and although this has been suggested numerous times, I'll still support it anyways. So one poison potion for ever 8 arrows? Sounds fair I think. They can be if you have a spider farm, which I do. Lol. Another down side is having 2 different types of arrows to track, which is my basic objection to any of the enchant/enhance arrows that have been brought up before. Ocean Floors have a lot of sand.. I don't think I'd be worried about that. Another down side is having 2 different types of arrows to track, which is my basic objection to any of the enchant/enhance arrows that have been brought up before. Then we'd bring back the quiver. Whichever arrow was in the 'fire' slot would get shot. Then we'd bring back the quiver. Whichever arrow was in the 'fire' slot would get shot. Once special effects are moved off the bow and onto the individual arrows, even in 1 case... then people are going to push for more... arrows of slowness... arrows of weakness... arrows of sharpness... flaming arrows... arrows of invisibility... etc etc. And then, combinations, poison + weakness + slowness, flaming + sharpness, etc. Now I can fill every available slot in my inventory with different arrow types and not have any room for anything else at all...and the quiver isn't doing anything for me EXCEPT to make it so my bow stops working when I run out of one type of arrow. Granted, that's a bit of an exaggeration... but I do it to illustrate a point. I generally just don't like different abilities (like enchantments and potion effects) granted to ammo that is largely consumed upon firing. But the point is not other types of arrows, but poison tipped arrows, and I like the quiver idea! Regardless of the effect of the arrow.. it should be able to be picked up as a 'blank arrow' afterwards... that way it isn't too OP. 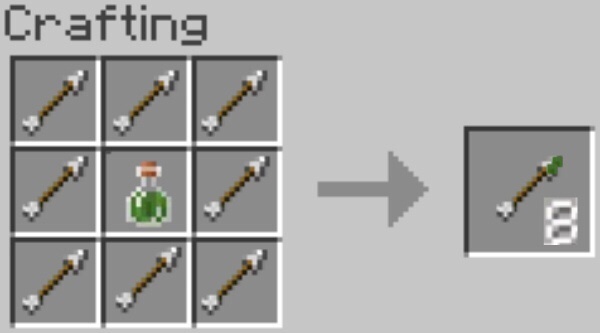 Once you apply poison to the tip of (8) arrows... they become (in game terms) a different 'type' of arrow at that time that can no longer be stacked with non-poisoned arrows and have different effects than normal arrows. Blank or still poisoned... I don't think it matters that much either way, especially since you can only pick up arrows that missed their targets (arrows that hit their targets are lost anyway). If this gets implemented, I probably would not use it....but then again, there are a lot of features in the game I tend not to use anyway. It does open the door to effectively 'enchanting' arrows with potion effects, so yeah, it could be a whole new way of using potions. I might not ever use it... not a huge fan of the idea overall... but as long as we'd get the bottle back, I wouldn't be too opposed to the concept.